"The Track of the Hook!" Doug: Chronologically, this was Deadman's 10th appearance -- he'd been in print right at a year by the time this issue saw the spinner racks. And not having read any of the Strange Adventures tales (yet), I'm going to suppose that this was his first interaction with anyone else in the DCU. 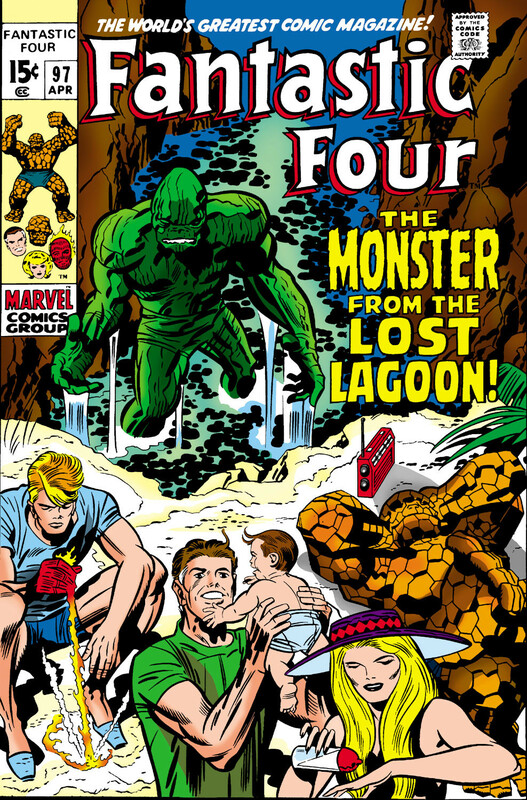 So this issue specifically begs the conversation -- were team-up books written for literary posterity, or as marketing vehicles for the co-stars? Hey, it's like a "Discuss" within a comic review! We begin as we often do, with a crime going down. We see an assailant with a hook-hand and a gun, and four panels into the story there's a homicide. 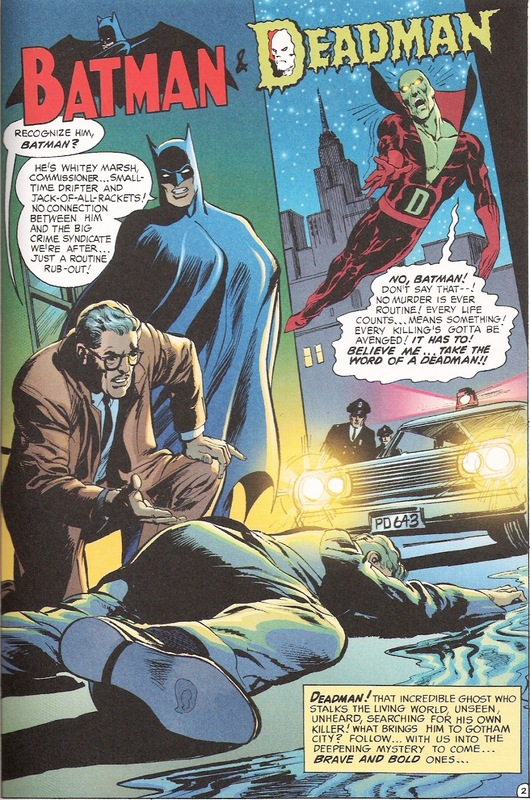 The splash takes place a few minutes later, as Commissioner Gordon, the Batman, and Deadman have approached the corpse. Batman of course IDs the guy, seemingly knowing every hood of any caliber in Gotham City. 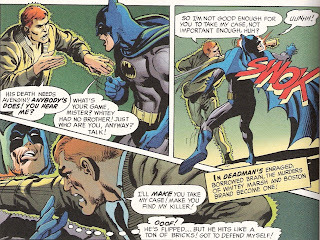 In Haney's first affront to characterization, the Batman utters, "He's Whitey Marsh, Commissioner... small-time drifter and jack-of-all-rackets! No connection between him and the big crime syndicate we're after... just a routine rub-out!" Deadman, on the other hand, gets it -- he says to himself, "No murder is ever routine! Every life counts... means something! Every killing's gotta be avenged!" And away we go! 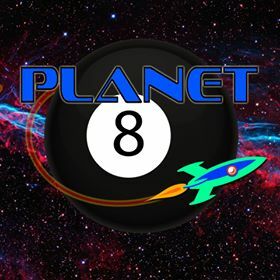 Doug: The antagonist is soon introduced to us in the form of "Kubla" Kaine, aka Carleton K. Kaine -- newspaper magnate. Kaine's intent on exposing the crime syndicate and chastises Gordon and the Batman for not putting them away. This was a little funny to me, as we're often exposed to storylines where Batman is working outside the law, with the law in fact on his tail! 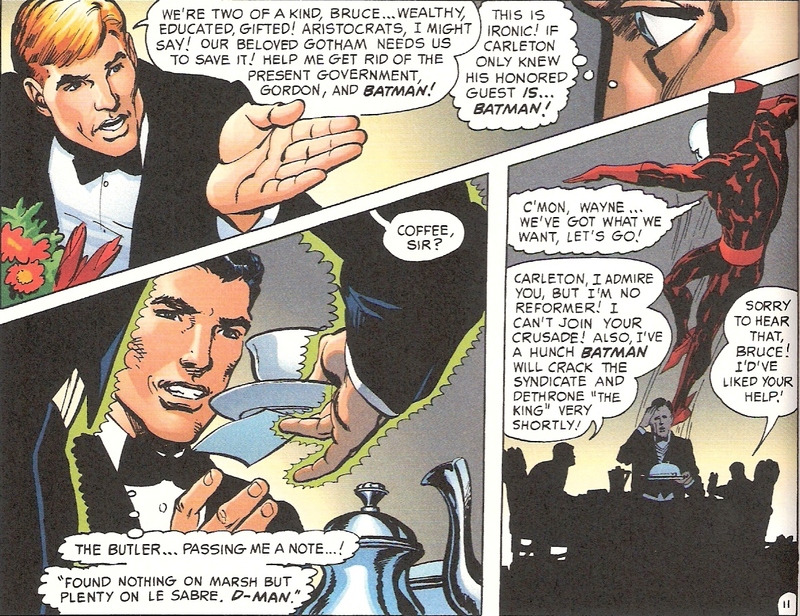 And to make matters worse, Batman and Gordon have a disagreement as to who the top dog is. Gordon thinks "The King" is Big Jim Coltrane, while Batman is leaning toward Jack LeSabre. Kaine jumps on their impromptu feud and threatens to force their hands in his papers. Just then, a mousy fellow emerges from the shadows and claims to have seen the murder. He begins to talk, and right away mentions that the killer had a hook. Deadman, drifting above the scene, zeroes in on that single word -- for it was a man wearing a hook on his arm who shot Boston Brand. Doug: Batman turns to leave, largely to get away from Kaine. As he exits, Deadman is desperate to stop him. The only way our phantom-hero can do so is to inhabit the body of another, taking it over. He does so, to a passerby, and has the man put a hand on the Batman's shoulder. Deadman has the guy say that he's Eddie Marsh, Whitey's brother. Batman doesn't buy it, as Whitey had no brother! Even more desperate, Deadman now has the guy take a swing at Batman, which connects. 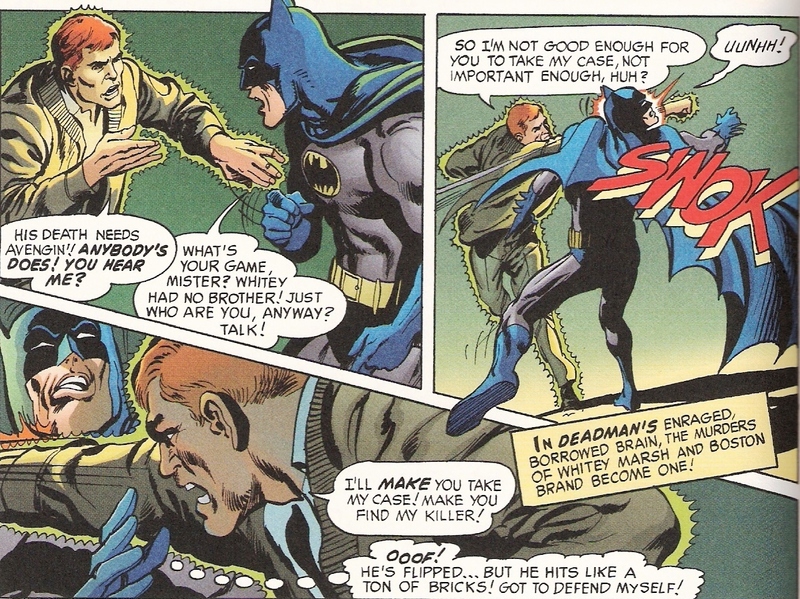 Again he punches the Dark Knight, but as he begins to come to his senses Deadman realizes he must flee the man's body. Of course he does so just as Batman lands a shot of his own. Kaine's still present as they guy, now in control of his own faculties, accuses the Batman of assault. This isn't going well. Batman smashes the camera of one of Kaine's flunkies and swings away before Gordon can arrest him (see, this is all just a little weird -- but that's a Bob Haney story for ya!). 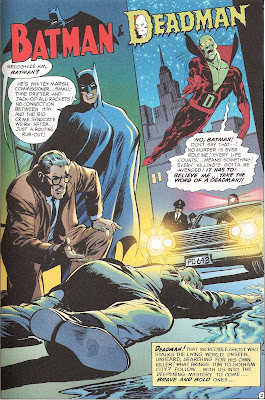 Doug: Deadman pursues Batman, and even saves him from being run down by a mob car. 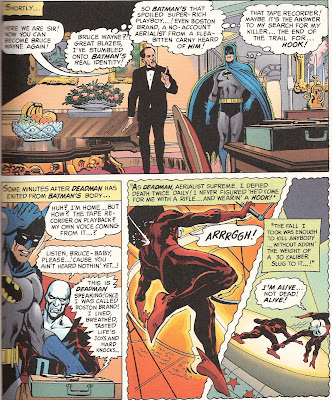 Deadman swoops down and into Batman's body, causing him to leap from harm's way. And who should happen along at the same moment but Alfred? "Batman" is pulled into the Rolls Royce by his faithful butler, and it's Deadman who now finds himself in that position of playing along. Entering Wayne Manor, the secret's up immediately. 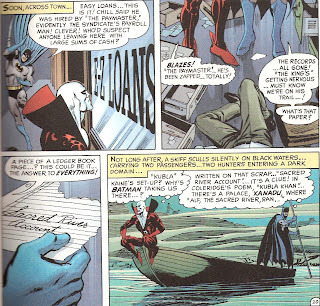 Deadman spies a tape recorder on a table, and as soon as Alfred leaves the room, he makes use of it. It's a now-restored Batman who hears the tape, in his own voice! On it, Deadman recounted his origin, and his dilemma -- that he would be able to inhabit the bodies of the living until he found his killer, the Hook, and avenged his own death. 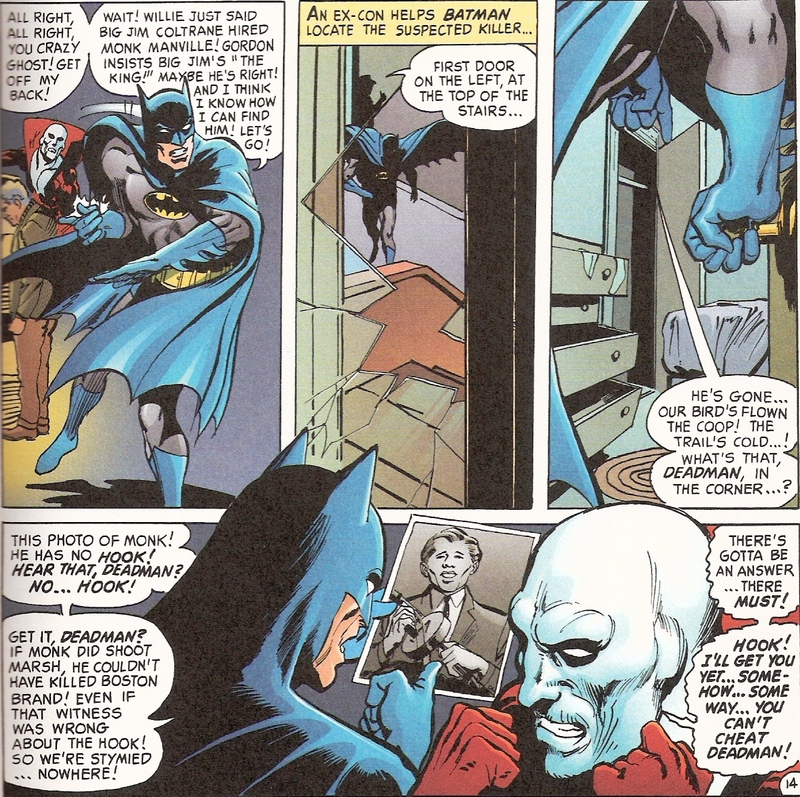 Batman is fascinated by this, and embraces the presence of Deadman in the room. Doug: Pigeon runs, and as he heads to a subway tunnel Deadman invades the body of an old man. Willie didn't have a chance. He's tripped, and it's Batman and some random old guy interrogating him! Pigeon fingers a Monk Manville, so it's off to find him. But when they do, the apartment's vacant. Inside, however, they find a photo of Monk holding a tommy gun -- but with no hook! So there're at another dead end. Until Batman reads a caption on the back of the photo -- a caption that says Monk Manville's real name is Max Chill! The guy they're looking for is the brother of the thug who killed the Batman's parents! I need to take a breath... Can you believe how dense Haney's stories are? I mean, he throws everything in but the kitchen sink and there are so many twists and turns along the way. As I said in one of the last B&B reviews I wrote, I have come to appreciate Haney's style (goofy as it can be at times). Doug: Thinking he missed something while trailing Whitey Marsh, Batman and Deadman double back to Whitey's Garage. There, they look at a control panel. Having paid no attention to it earlier, Batman pushes some of the levers, and a wall recedes to reveal stacks of slot machines. 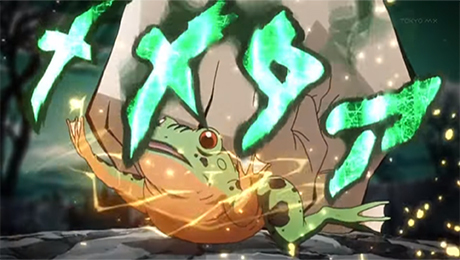 Whitey was running a gambling operation for the syndicate after all. Suddenly, Max Chill (aka Monk Manville) appears from around a corner... and wearing a hook on his right arm! 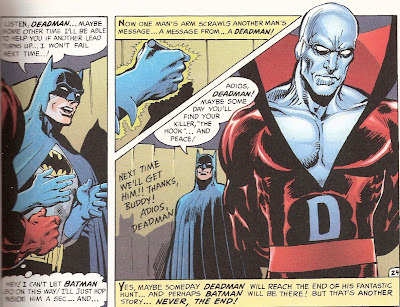 Deadman had invaded Batman's body, hoping to take Chill on his own -- and when Chill does appear with the hook Deadman cannot believe his eyes! 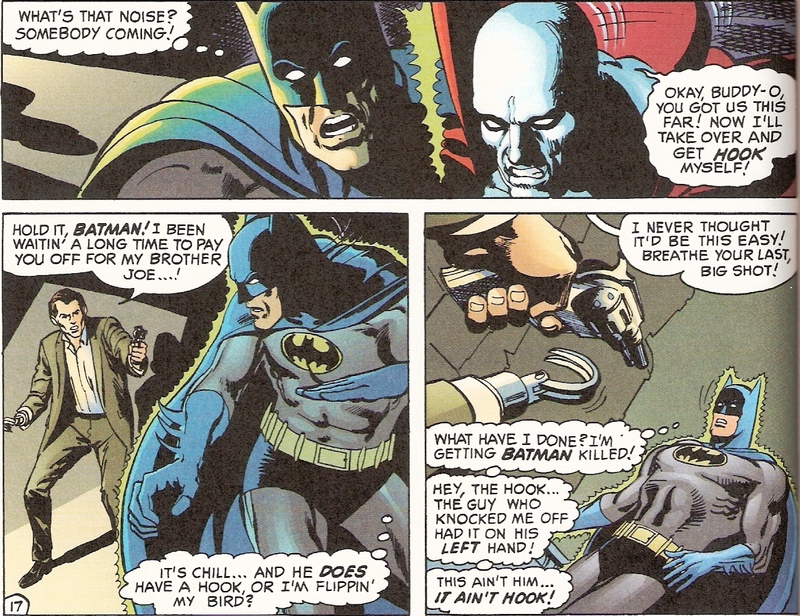 But wait -- Deadman recalls that The Hook wore it on his left arm -- Max Chill ain't the guy! 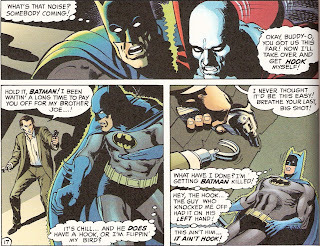 As Chill fires at "Batman", Deadman hurls a bunch of coins at him. Chill isn't fazed, and manages to cut the body of Batman a few times in the fracas. 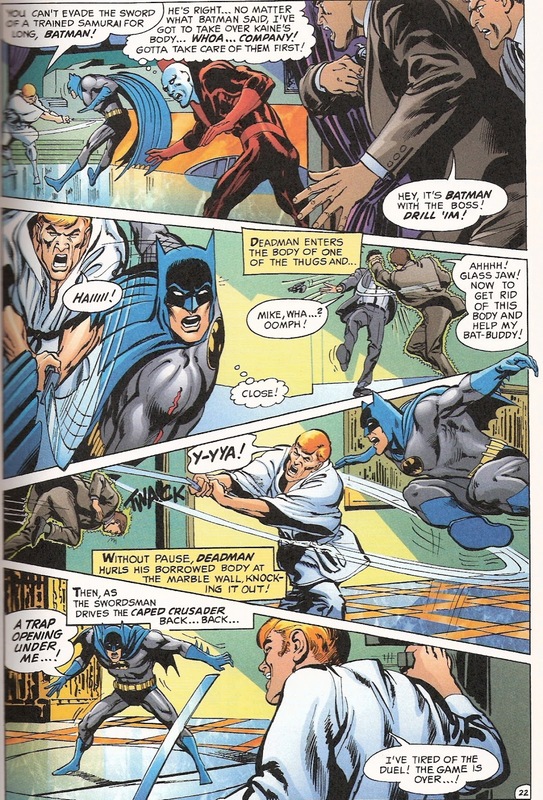 Deadman decides he cannot control the Dark Knight's body as well as Batman can his own, so flees at the moment Chill is about to deliver a death blow. But Batman rights himself quickly enough, and his kick sends Chill back into the pile of slot machines. They topple over on top of him; but before he dies he tells Batman that the guy he wants, is "the Paymaster" at Easy Loans. Doug: Tracking this new lead, Batman and Deadman find that the loan guy has been offed already. The only clue they can find is a torn piece of paper that reads "Sacred River Account". Batman recalls a poem by Coleridge called "Kubla Khan", where the king inhabited a palace called "Xanadu". And the sacred river "Alf" led up to it. 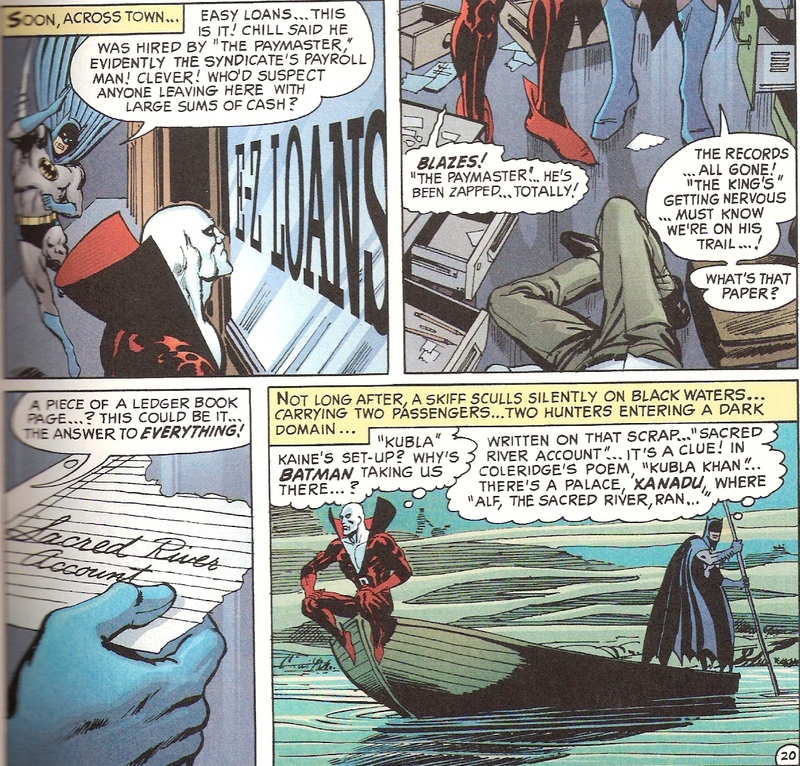 Knowing that a creek ran next to Kaine's mansion, Batman and Deadman commandeer a boat and head upstream. Invading the residence, a scuffle takes place. Kaine attacks Batma with a katana. Two henchmen answer a summons from Kaine, but Deadman invades one guys' body and takes out his partner. Batman, meanwhile, is having problems. His cape is cut off near his shoulders (but remains scalloped, strangely). Batman feels himself standing on a trap door, and as it opens he lunges for Kaine. Striking him and knocking him back, they tussle. However, the butler recovered from Deadman's initial attack and begins to level a gun at Batman's back. As Deadman rushes in invade him, the gun goes off. Fortunately, and as fate would have it, the bullet hits Kaine's sword, deflecting right into his heart. The adventure, the syndicate operation mystery, and the search for The Hook is over. Batman and Deadman part on solid terms, Deadman to resume his search for his murderer. Doug: This was a good story, although like I said above a bit willy-nilly. Adams' art, however, seemed a bit off at times. While I understand this was relatively early in his Batman illustrating, there were times when I felt the art segue into a Carmine Infantino or Nick Cardy motif (I know, you could certainly do worse). And the "updated" coloring -- while I've liked it in the Tales of Asgard series we looked at, and the Chronicles of Conan reprints, here it just seems to be too much. There were a few times when Adams seemed to get really obnoxious with whites. 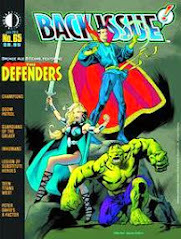 Give me the four-color reprinting we've been looking at in the Aparo book; Neal's messing around has a George Lucas meddling sort of vibe to it. I'll have to go back and read this issue. I have Batman Illustrated, and I remember all the complaints about the new coloring. Either leave it as original coloring, or recolor it well! Adams also redrew some of the faces--you can see examples online. Not good. AFAIK, this was the first time Deadman interacted with a character from another series. In fact, I got the impression that Strange Adventures was aimed at a different audience than Batman. 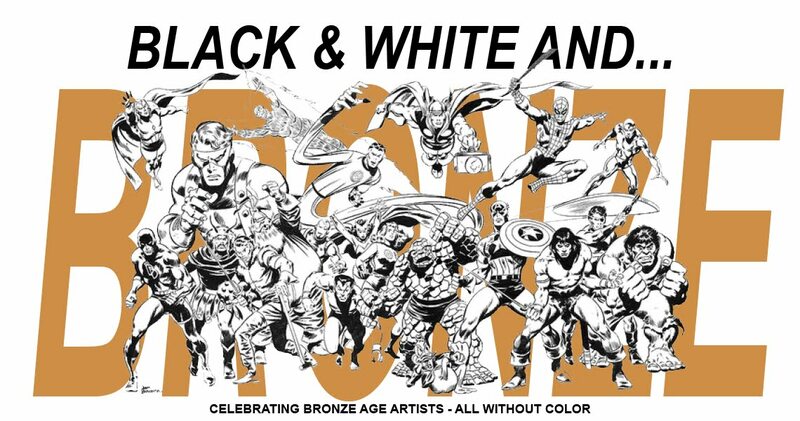 Among the kids I knew (classmates, relatives, neighbors), the ones who read the horror/mystery and war comics were a little older than the super-hero fans. 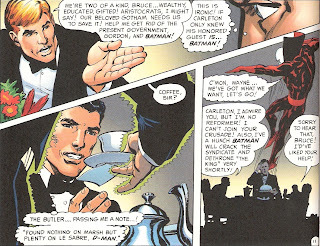 We kind of took it for granted that Batman would regularly team up with the other JLA members, but we just didn't necessarily expect him to meet Deadman or Sgt. Rock. The rule that all characters published by a given company had to exist in the same universe didn't really come about until the 1970s or later. As for literary posterity, I think DC was more concerned with just publishing magazines that would sell. B&B was probably seen as a showcase, providing some needed exposure for the guest stars. DC was out to make profits, not classics. As it turned out, they sometimes managed to make both. Keep up the good work here, Doug. These B & B posts are a highlight for me. I've said it before, but the sheer amount of plot-work that Haney can squeeze into an average of 20 pages is extraordinary. He really was a master at keeping the internal logic of a story intact enough to make his goofy plot-twists hold together. He took a lot of chances, and that's not such a bad thing. Contrast his stories with the sheer dullness of much of DC's output at the time. We're seeing the very beginnings of Adams' vision for The Batman here. It would slowly evolve over the next few years (along with his skills in general). But this is a giant step up from the Infantino style. I can't hear Adam West's voice in my head with this issue. Speaking of which, I've been catching up with the 60's Batman show in reruns lately. I've gained a new appreciation for it. It's genuinely hilarious. I think Adam West has been taken for granted. He wouldn't have been right for a serious Batman, but he was a good actor with great comic timing. There are a lot of subtle inflections in his Batman work. Has "The Senator's Been Shot" been profiled yet? It would make a good companion piece with todays post. And, it's an important stepping stone to the Bronze age. 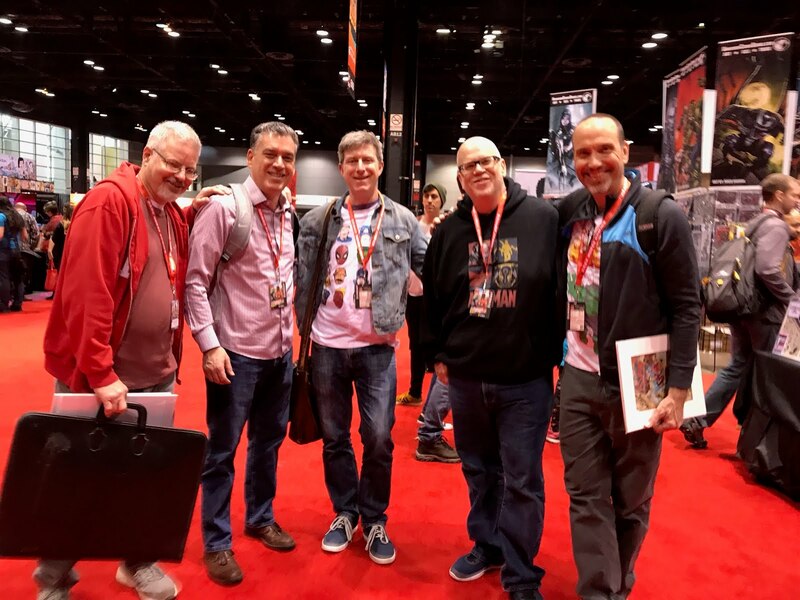 Who's the Best... Avengers Writer? 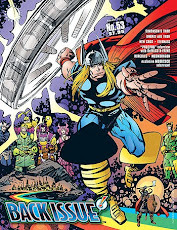 Who's the Best... Thor Artist?